The Seville copper sink is designed to be function, affordable and easy to install. This drop-in copper sink is ready to make a statement in any bathroom remodel. Sinkology artfully handcrafts each sink from pure solid copper. The Seville copper bath sink features an overflow system and 4 inch faucet holes. The Seville is designed to be the best copper bath sink you could own and install yourself in a quick and easy DIY project. The Cimarron collection combines the best of traditional and contemporary design for a versatile look that complements a range of bathroom styles. Beveled edges and simple lines enhance the uniquely shaped basin. Reminiscent of a bygone era, the molded edges and subtle curves of the Devonshire sink add distinctive visual impact to your bathroom design. This petite oval basin is an excellent fit for most bathroom vanity sizes. Odeon combines spheres and arcs for sleek, European styling. With a compact shape and overflow drain, this sink is ideal for small bathrooms and powder rooms. Seville Drop-In Bathroom Sink with 4-inch Faucet Holes with Overflow in Aged Copper The Seville copper sink is designed to be function, affordable and easy to install. This drop-in copper sink is ready to make a statement in any bathroom remodel. Sinkology artfully handcrafts each sink from pure solid copper. 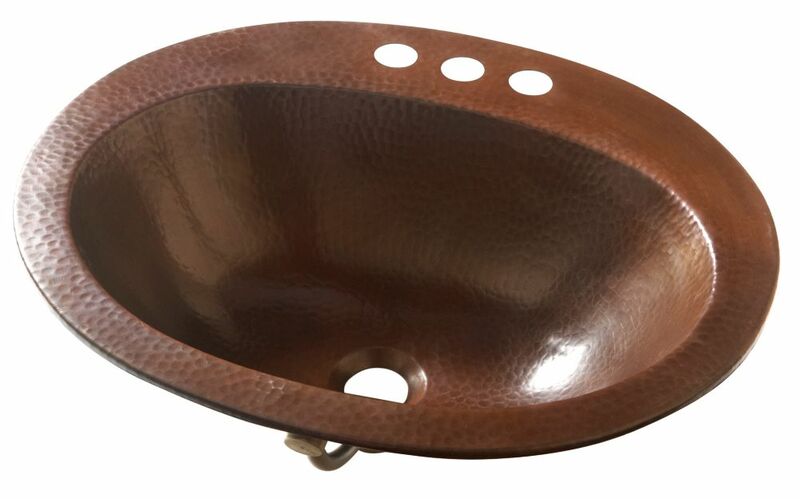 The Seville copper bath sink features an overflow system and 4 inch faucet holes. The Seville is designed to be the best copper bath sink you could own and install yourself in a quick and easy DIY project. Seville Drop-In Bathroom Sink with 4-inch Faucet Holes with Overflow in Aged Copper is rated 4.2 out of 5 by 33. Rated 2 out of 5 by Chanel from Beautiful but would not fit standard sized cut out.Had to... Beautiful but would not fit standard sized cut out.Had to return. Rated 5 out of 5 by Linds from I can’t speak for the installation process as my husband... I can’t speak for the installation process as my husband installed them but they look fabulous in our newly remodeled master bathroom! Rated 5 out of 5 by Chanty from Easy installationLooks great ! ... Easy installationLooks great ! Rated 5 out of 5 by Denise from We love it! We love it!